The Social Network, the dramatized examination of the personalities and incidents behind the launch of the Facebook social media movement, was named Best Picture in the 14th annual Online Film Critics Society Awards. 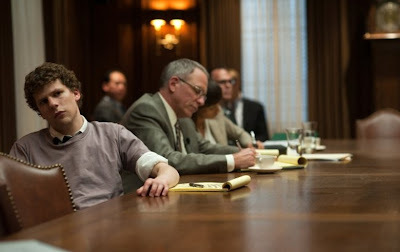 The film also won in the categories of Best Director (David Fincher) and Best Adapted Screenplay (Aaron Sorkin). The OFCS Awards for acting were divided among a quartet of productions: Colin Firth in The King’s Speech for Best Actor, Natalie Portman in Black Swan for Best Actress, Christian Bale in The Fighter for Best Supporting Actor and Hailee Steinfield in True Grit for Best Supporting Actress. True Grit was also honored for Roger Deakins’ cinematography. Inception received two awards: Christopher Nolan for Best Original Screenplay and Lee Smith for Best Editing. Toy Story 3 was named Best Animated Feature, Exit Through the Gift Shop received the Best Documentary Award, and the South Korean production Mother was named Best Picture Not in the English Language. Founded in 1997, the Online Film Critics Society has been the key force in establishing and raising the standards for Internet-based film journalism. The OFCS membership consists of film reviewers, journalists and scholars based in the U.S., Canada, Europe, Latin America and the Asia/Pacific Rim region. For more information, visit the Online Film Critics Society at www.ofcs.org.